There was excitement in the air in Hobart last year when over 200 scientists from 22 different countries converged for the second International Partnerships in Ice Core Sciences (IPICS) Conference. 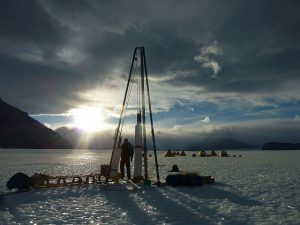 IPICS is an expert group within the Scientific Committee on Antarctic Research, and has recently begun planning the drilling of the oldest ever ice core. Three kilometres below the surface of the glacier scientists hope to find ice up to 1.5 million years old. An Antarctic ice core drill. Image from Oregon State University on Flickr (licensed under CC BY-SA 2.0). Nobody is getting too far ahead of themselves. The project goal is for a one million-year ice core. It’s become affectionately (if not creatively) known as the million-year ice core and is set to be drilled in 2020. Our oldest ice core record, at Dome C in Antarctica, currently reaches back 800,000 years. A record this long gives enormous insight into whether current warming trends can be explained by natural variability. Dome C tells us that CO2 levels have never been this high in the past 800,000 years, nor have they increased this fast. This is a damning fact, and one of the strongest statements made on human-induced climate change. Extending the ice core record a few thousand years isn’t likely to change this. So why is this core being called the ‘holy grail‘ of climate science? We are lucky here on Earth to be located just the right distance from the Sun to sustain life (the so-called Goldilocks Zone), but our orbit of the Sun isn’t constant. Over long timescales (tens of thousands of years), our climate varies due to subtle changes in our orbit. These changes, called Milankovitch Cycles, come in three flavours. 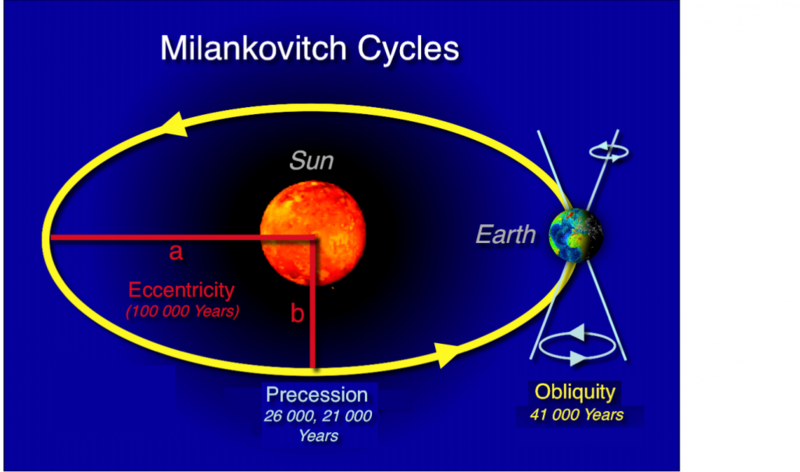 Milankovitch theory is widely accepted to cause glacial cycles. Image adapted from Wikimedia (Licensed under CC-BY-SA-2.5). As these factors vary, the Earth goes through glacial and interglacial periods (known as glacial cycles). For the past 700,000 – 1 million years, the Earth’s eccentricity has been the dominant factor in controlling the Earth’s climate, with the others playing a supporting role. We know this since glacial cycles have a clear 100,000 year period – exactly as long as Earth’s eccentricity cycle. Sometime about 1 million years ago this changed. Prior to this glacial cycles followed a strong 40,000 year cycle – exactly as long as the obliquity cycle. There are a number of reasons why drilling a core this old is so challenging. The first won’t surprise you. With an average temperature of around -50°C, Antarctica is an inhospitable place. Combine that with the logistical difficulties of getting there and setting up camp and you begin to realise how hard ice core drilling is. And that’s just the first step. Getting an ice core this old is a whole new ball game. Ice this old is so rare due to the presence of ‘hot rocks’ under the ice. The landmass buried beneath the Antarctic ice sheet is much warmer than the surface. So much so that in some places the ice sheet is melting from below, so old ice is melted away. In fact, ice cores drilled at the Antarctic Vostok Station in recent years discovered the presence of vast lakes (that’s right, liquid water) underneath the ice sheet. Scientists are understandably excited about finding such old ice, and with it the longest ever continuous reconstruction of Earth’s climate. If and when they do, the next challenge will be using it to further understand modern day climate change. Previous Previous post: Could Music Be A Cure For Mental Health? Hi Dominic. It is such fascinating how the drill core can reveal geological history of Antartica. Analysing the core would tell what happened to our Earth millions years ago. Interesting topic, Dom! I bet it wouldn’t be easy to transport a one million year core.